Aggressive direction. Aggressive, bold, confident and unabashed. I liked it a lot. And the cinematography � flat out gorgeous. This film busts out of the projector's gates like a break dancer on ice. Sepia stills slowly warp in and out with a sweetness, sincerity, and humor very seldom found during title sequences. Very quickly the players are introduced and wasting no time at all, the music starts thumpin� and the dancers take to the floor, the walls and the air. The first act of this film shows off some stunning dance and dance photography with high speed captures that are slowed with exceptional grace, art and flair. I liked it a lot. Soon enough though, the real story begins, the pace slows a bit and the picture relies on its only fair to midland acting. That said, the players each have great charisma and backed by the sweet shots and powerful direction, the film never fails to engage. Oh, and when Terrence Howard finally kicks in � whew, now he can really tear it up. 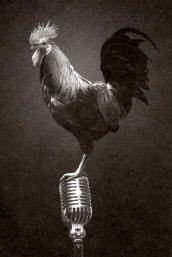 My biggest criticism is that the grown up Rooster never sparks on stage as the young Rooster did on the sidewalk. Actually, though entertaining, the rest of the dancing and dance photography never tops that of the opening act. Also, the lyrics to the songs were not quite discernable. Too bad too, because the few that I did catch seem relevant to the film. Lastly, though the production shines original in so many other ways, the film�s story eventually falls prey to clich�. That may have been the intent, sort of an homage to gangster films of the early 1900�s � but either way, still clich�. This is the closest thing to the film Chicago, I�ve seen. It�s smashing. A bit stronger in the overall acting department and a more original storyline � this picture would be full out A+. That scene with the stuttering gangster had me in stitches. Somewhere between an A- and a full A. I'll round up for the solid direction. Starring Andre Benjamin, Antwan A. Patton, Paula Patton, Terrence Howard, Faizon Love, Malinda Williams, Cicely Tyson, Macy Gray, Ben Vereen. Produced by Green, Robin O'Hara, Scott Macaulay at Universal Pics/HBO/Mosiac/Forensic.